THIS is the iconic spot. 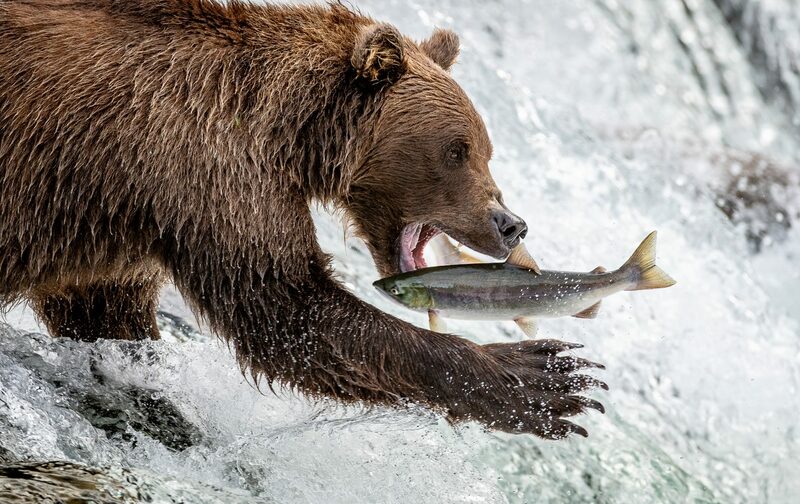 The place where the famous photo of a bear catching an airborne salmon in his mouth from atop a waterfall was captured by Tom Mangelson over 30 years ago. His image put Brooks Falls on the map and Katmai became a dream, lifetime destination to see the congregation of bears in the summer months as the bruins fatten up before winter. The Wild Departures Difference: While most tours offer day trips, Wild Departures takes guests to Brooks Falls for a 3-night stay, maximizing the opportunities for morning and evening light and an immersion into bear behavior and activity. For wildlife lovers and wildlife photographers, there’s simply no place like this on earth. Trip Level: When you think of Alaska, you think of bears. On this trip, we guarantee you’ll see them or we’ll refund your deposit! While this trip is perfect for shutterbugs, others who enjoy wildlife viewing will get a true Alaska adventure. To join this trip, you must be able to walk at least 3 miles on level ground and ride comfortably in planes and shuttles. The activity level is rated 2 / easy to moderate. Avid photography enthusiasts (beginners to professionals) should bring (you can rent them too) a digital SLR camera, a 300mm lens or better, and a tripod, and be familiar with basic manual menu settings prior to the trip. Join Michelle Theall, senior editor at Alaska magazine and an award-winning professional photographer for the title on an EXCLUSIVE Alaska bear viewing and photography excursion. In her role as editor-in-chief of Alaska Magazine, Theall had the opportunity to explore Alaska in a way few others have, enabling her to find the best locations and vendors along with perfecting the logistical acrobatics needed to navigate an immense state with few road systems. The result: Theall’s tours through Wild Departures offer the very best of the state with one of the most knowledgeable guides available. Comfortable shared accommodations with modern amenities in the only lodging available at Brooks Falls, and buffet-style, hardy meals. 1-hour+, round-trip flightseeing tour to and from Anchorage to King Salmon to Katmai. 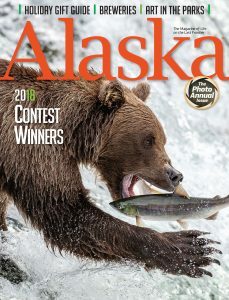 Daily photography instruction, along with educational dialogue about bear behavior and the flora and fauna of Alaska, while shadowing Alaska Magazine’s award-winning photographer for the title. A framed image of your favorite shot from the trip, shipped to your home on your return. Airfare to and from Anchorage and your home and gratuities not included. Full terms and conditions available with deposit. For more information or to secure a spot on the trip, please contact info@wilddepartures.com ASAP or book immediately by submitting your deposit below. Or, call: 720-635-1380 for additional details.